Fake news is a term that is used, some would say abused, on the Internet to describe untrustworthy content. Whether content is indeed untrustworthy or inaccurate is often a matter of opinion and not of facts. Trusted News was designed to be an indicator of a site's trustworthiness so that users know right away whether content on the site is deemed trustworthy. Trustworthy -- The site is trustworthy because it publishes content "based on facts and/or factual events". Untrustworthy -- The site or page "knowingly publishes false and/or misleading information". Unknown -- Site evaluation lacks data. Satire -- Site is known for publishing satirical content. Biased -- Site publishes biased content. Malicious -- Site distributes threats. Clickbait -- Site uses misleading titles or descriptions. User-Generated Content -- Content is created by third-parties. The ratings are based on the MetaCert Protocol which uses data from "independent fact-checking organisations" such as PolitiFact, Snopes, Wikipedia and Zimdars. Only organisations that are not politically affiliated, independent of Trusted News, and transparent in their fact-checking processes have been selected to power the Trusted News extension. The extension is available in beta right now. The company plans to improve the extension in the near future by adding feedback and reporting options to it among other things. The developers of the extension promises that the extension keeps user browsing data private. Do you need a browser extension that informs you whether content is trusted? It depends on several factors including your Internet activities and whether you trust the fact-checking organizations that Trusted News relies on to determine which companies and sites publish trustworthy content. The extension seems to focus on sites right now and not individual pages. It should be clear that a granular approach would yield better results as some content on trustworthy sites may be untrustworthy, clickbait or biased, and vice versa. Now You: Would you use an extension like Trusted News? Would I use an extension like Trusted News? Fake news being an issue nowadays I’ve had the time to wonder how I personally deal with this matter as well all of us do. My belief is that if there s one thing worse than fake news it is the very concept of a tool dedicated to separating the good grain from the chaff, declaring one source as trusted and another as fake. Sorry for the analogy but I have in mind moralists and gurus, the former pointing to the good and bad, the latter to truth and lies. This contributes to a loss of responsibility, moral and mental. Delegating to anyone, any entity the authority to state what is and what is not remains, IMO, essentially wrong. So, if facts are less problematic anyone should be able and willing to check a sensationalist headline by accessing to other sources. As for opinions, I know no one authorized to assert what is fake and what is true. So, no, I wouldn’t use an extension like Trusted News. I don’t read news at all mostly because they are crap. If the news is really big and really important, you will come to hear it one way or another. Unless your work requires you to be up to date in some area, I’d advise to avoid news at all. If there are news for a world war, an alien invasion, zombie apocalypse or a regular apocalypse, everyone will know it, otherwise everything else is a waste of time. It’s as lowly as using facebook and other social media and scrolling down to read all the drama and wasting your time. I would prefer that any news aggregator show all sides of a story. In the US, show me CNN and Fox news stories. Let me choose what to believe, if anything. To let others decide for me what is fake news? Never.This is a dangerous political approach to censor the internet, see the Eu Ministry of Truth: https://euvsdisinfo.eu/ which caused an uproar in The Netherlands by falsely condemning some websites. The Dutch Parliament condemned the rogue practices of this Fake- Fake news committee. I agree that letting others decide is not desirable. One could argue, however, that the extension does not really decide anything for you. It gives you a rating for sites and what you do with that rating is up to you. Do you think that they also give those high ratings to let’s say “The Dutch communistic party news website (Being the most reliable, detailed, hawkeye view and honest news website I ever noticed on the web) because of the word communistic in their title? I ask this because I have noticed over the years because the word communistic is working like waving a red flag for a bull especially when its an American company like google concerns. The main issue that I have with services that give you ratings on news or sites is that it is often impossible to tell how they picked certain ratings for sites or news. I don’t trust anything blindly and prefer to make up my own mind (using research and reason) to conclude whether a site or article is trustworthy, flawed, outright wrong, clickbait or whatever. I think it would help everyone if people would use different sources for news and such, and not consume only the sources that tend to agree with their worldviews. This is getting too political already; as for your question, I don’t think that the name of a publication will have an impact on its rating. Again, I don’t know the criteria that the mentioned services use to rate but I would imagine that this includes at the very least a thorough analysis of current content published on the site. If you’re educated enough to use this, chances are you don’t need it. Perhaps it should come installed by default. Yet I doubt it will flag Fox News or Mail online as ‘Untrustworthy’ without some push back. Nor would I trust an app that said Forbes is without bias. Or CNN for that matter. All your examples are trustworthy news sources according to the extension. I think it depends a lot on definitions and how those that decide on ratings interpret them. This is from the same shady company which is regularly bribed by advertisers to let their ads through, shamelessly pretending the community “wished for” those sites to be put on the white list. Some people of the Eyeo staff have ties to the ad industry. German blogger Sascha Pallenberg exposed them long ago, look it up. Enough said. I sincerely hope AdBlock Plus + parent company goes bankrupt with no users left, so that uBlock Origin can take its rightful place. You raise a very good point. Money can buy anything. Even some of the best free software packages can (and have) become corrupted by money. The KISS principle applies here. The less exposure you have, the better off you are. That solves part of the question which is to know if we’d use a “news checker” if we don’t believe the checker isn’t reliable, be it in terms of talent or honesty. Remains the basic problematic which is to know if we’d use a “news checker” if we have full confidence in the checker’s reliability, impartiality. For my concern even in this context I would rely on such a checker, should it be for the sole reason that mistakes can blind honesty, and that mistakes are far more dangerous than dishonesty given they are free of that “smell” specific to hoaxes. That solves part of the question which is to know if we’d use a “news checker” if we don’t believe the checker is reliable, be it in terms of talent or honesty. Remains the basic problematic which is to know if we’d use a “news checker” if we have full confidence in the checker’s reliability, impartiality. For my concern even in this context I would not rely on such a checker, should it be for the sole reason that mistakes can blind honesty, and that mistakes are far more dangerous than dishonesty given they are free of that “smell” specific to hoaxes. I always forget to re-read my comment as well as the fact it isn’t editable once sent. The guys at Eyeo GmbH are corrupt frauds. One of their major „clients“ is Google, which basically means that AdBlock Plus lets ads from arguably the biggest advertising network through… Of what use is an AdBlock extension which doesn‘t do what it is supposed to do? You can opt-out of that, yet Eyeo GmbH of course hopes that you won‘t, provided you even know of the opt-out. Eyeo GmbH earns a giant load of money (eight digit figures), and Google (and other biggies of the industry) makes sure that the most popular adblocker is in their pocket, thereby hampering the growth rate of legit offerings like uBlock Origin. I wouldn‘t use any product offered by the corrupt Eyeo GmbH, and would recommend you to do the same. They are not trustworthy at all. They accept bribes, and have the audacity to use the community as a scapegoat for their greed, lying in the face of their users in the process. Avoid them at all costs, you‘ve been warned. I thought it would be beneath you to present product of this greed-consumed untrustworthy company. Guess I was wrong, very disappointed. I had in mind the more general concept of using or not a news’ authenticity extension (in the style of this ‘Trusted News’. Thanks for the warning (reminding me Appster who used the same wording), obsolete as far as I’m concerned given I’m a uBO user since the extension (add-on, then) first appeared, after having been an ‘AdBlocker Plus’ user. I wasn’t then really annoyed by its ‘acceptable ads’ feature as I considered it as an invitation to test an equation which would bring advertisers to a healthier practice of their publishing policies and still allow users to opt out. I do remember that nevertheless I thought that ‘acceptable ads’ should be opt-in and not opt-out. All this is old now. I think what’s interesting here is to know if we’d rely on a news authenticity extension – even – if we totally consider the extension’s developer as 100% worthy. I’m sorry to hear that you are disappointed. I don’t think that staying silent about something controversial is the right way to handle it. Let’s say you need a news authenticator, wouldn’t your first concern be the impartiality and anti-corruption stance of the entity behind it? This news authenticator as a product fits in nicely with their internal policy, which is to accept $$$ when it comes to letting certain things through that shouldn’t be there, at all. Given their history, I expect them to flag even the most untrustworthy site as “legit” as long as the cash flow in their direction doesn’t run dry. This also opens up the possibility of competing companies paying Eyeo to flag each other. @pHROZEN gHOST is right of course, money can corrupt projects. Though I, the user, do not benefit from their scam, which happens to be to my disadvantage. And they lie about the whole story, shamelessly. Thus, the only way to go for me is to support legit competitor offerings. I would do the same with uBlock Origin should its dev sell out one day, needless to say. I am not at all debating whether or not such an extension is needed. However, the staff of the parent company is composed of lying frauds, quite literally. PallenGate (a series of articles written by Sascha Pallenberg regarding that company – forming the basis of my claim) has exposed them thoroughly. They are a scam, and it saddens me to see any of their products being promoted by gHacks without even hinting at prior scandals of the Eyeo GmbH. Their backstory is compromising any and all of their products, and features they claim to offer should be taken with a grain of salt at the very least. To answer your question, “Let’s say you need a news authenticator, wouldn’t your first concern be the impartiality and anti-corruption stance of the entity behind it?” I’d say that my first concern would be to wonder about the concept before wondering of the tool. do I consider that the opinion I have about a person or entity influences my acceptation of its advice? Yes, and I’d add: unfortunately yes. Why “unfortunately”? Because 1+1=2 whatever the honesty and talent of who proclaims it. Conclusion: I aim to forget judgements, be they those of talent or honesty, as a factor of truth or not of what a person or entity may state. I’ve experienced situations where I’d banish information on the ground its issuer was in my point of view insolvable. I’ve experienced situations where I’d say the truth in such a way that I’d hope to be considered as a liar, i.e. when in a dangerous bar surrounded by dangerous guys who started looking at me with fists in their eyes, I said “hey, I’m no cop, buddies” (must say many people consider I have a cop’s face). I am not a cop but proclaiming I wasn’t was aimed to make those guys believe I was, and it worked. See what I mean? I believe our view on information must be liberated from personal judgements on the issuer, but I admit that I happen to forget this aim as I still label the veracity probability of information on my beliefs of the issuer’s integrity. Last but not least, a news authenticity analyst is in itself a news issuer given it brings information, valid or not, about news issuers. Condensed: consider information as well as information about information in a raw, cold, non passionate approach. This is an aim, here. I agree with that, but some background info about the questionable reputation of Eyeo GmbH would not be out of scope of your article. Especially not since your article is about an extension in which the word ‘Trust’ is quite essential. Could be useful only as additional information and people are aware of that. I don’t like too much this kind of approach; worse if you do it on sites and not on individual pages. It’s better to solve the problem earlier on in the process implementing at school how to do fact cheching, carefully assess the sources, read statistical data and other means available to evaluate a news. More knowledge and instruction, less classifications of contents. @Shiva, I entirely agree, always better to teach how to fish than to provide fish, better to educate than to assist. Education here means to teach what freedom of mind is and not what should be put in that mind, in other words help to clear the path to objectivity, even if never reached. But don’t tell people this is true and this is fake unless to consider people as robots which need an algorithm to discover the truth. That is the worst scenario but does accredit the idea masses are more and more considered as brainwashed robots to be. That’s the potential dangerous problem – these validating services may be used to mold specific opinions by ruling sites and content out. Did we – as people, really become that lazy and stupid that we can’t judge the content by ourselves and we need to assign specific people or algorithms for that so they would tell us what to think? That is news. Fake or not? I forget the hypothesis of your dishonesty to focus on the exactitude of your assertion. Are we in the ‘opinion’ area or within facts? May facts discredit an opinion? Facts concerning Wikipedia are that the website itself has no political/societal guideline, it is fed by all and consequently mistakes may appear, be they native or those of editors. I wouldn’t blame Wikipedia as such but rather consider the place as the illustration of the fact knowledge and information are dynamic and the exclusivity of no one. So now they decide which news are real and not. Same way your government decides what are “real” news to present on government tv networks. The more someone claims something is “fake news” the more truth is there to find. I had forgotten a French media, lemonde . fr, which has a similar tool called ‘Décodex’ but which I never called upon : https://www.lemonde.fr/verification/ (in French of course). This shows that if we are not all the cause, the origin of a hoax/fake we may very well be part of the unhealthy chain that propagates it : we believe it’s true and pass it on, and that ain’t no good, of course. The screenshot featured in the article here, combined with the categories outlined in the article, told me all I need to know about this extension. 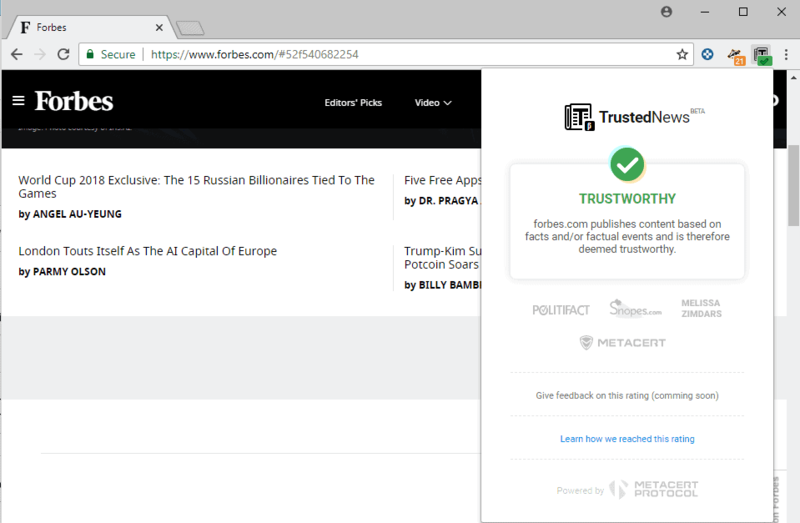 Forbes.com was rated “Trustworthy” instead of “Biased”. Now, let’s look at Forbes, for a minute. It’s editor-in-chief is Steve Forbes, the very conservative Republican former Presidential primary candidate who repeatedly called for “slaying the dragon of the tax code” with a very regressive 17% flat tax that would have killed revenue for social spending and important infrastructure because of the decline in revenue it would have represented to the federal government, and shifted a higher percentage of the remaining taxes to the middle class from the wealthy relative to then-existing percentages (I believe the poor were exempt if they could prove they were poor). Now, it’s entirely possible that a guy who has his own very strong very public political bias could go ahead and edit a magazine with a neutral editorial stance, but, in this case, he isn’t. The magazine definitely leans right on all matters economic, and always has. It’s not “Fake News” (i.e. They don’t publish random things not based on facts), but it is “Biased” (Real news presented with an editorial bias). So, back to the main question, would I be interested in an extension like this? Yes, I would, but not this one. Clearly, to me at least, it is not yielding accurate results, which is worse than me trying to figure stuff out on my own. If an organization that I knew and thought was trustworthy put something like this out, and rated the websites I am familiar with the way that I would, then I would give it a try, since it would potentially help me out in sorting through random links to local and obscure news sources with which I am not familiar. Forbes.. “deemed trustorthy”. Clickbait trash “deemed trustworthy”. Yeah, the extension is useless. Wanting to control what ads are “acceptable” then what news are acceptable, not surprised. This compagny is evil. No thank you, Nanny G.
Search feature at the top no longer working for me, and the change break the blue style made by Richard. The most damaging disinformation mostly come from mainstream press sources that belong to billionaires protecting the interests of their social class against the people. They are the ones who invented this “fake news” rhetoric to keep the monopoly of this practice and also censor small dissident sites who may actually tell the truth. Why are you even advertising for this crap ? How does ghacks rank on there? And yes, this is a news site, not like BBC or CNN but it specializes in tech focused info. And pulls from other news sources. Which brings up another question. If a reputable news org like New York Times links to dubious material from let’s say infowars or zerohedge, that could make a positive ranking superfluous, there’s too many variables for a scaled approach to something like this. Trusted news, isn’t that kind of an oxymoron, especially when you consider the browser itself is proprietary and no one outside of Google really knows what it’s completely capable of? My big questions will always be – What exactly is fake news ? Who decides what fake news is ? The problem is that *every* news outlet has some degree of bias, in one direction or another, depending on who its owners are, who its advertisers/underwriters are, who its staff are, and what external influences it’s subjected to. (Regarding external influences, Operation Mockingbird and Gekaufte Journalisten come immediately to mind, but the US is far from the only sinner in this area.) Any news-certifying service like this one will have the same problem. To my mind, one of the most important things we should be teaching children in school is to evaluate news not just on the basis of the stories the outlets choose to cover and the evidence they choose to present, but also on the bias factors I just mentioned. Properly educated citizens consume news from a *wide* variety of sources with a *wide* variety of biases — *much* wider than just CNN vs. Fox, in the US — and if they are lucky, sometimes something vaguely resembling a complete picture emerges from the clash of propaganda and counter-propaganda. Like deciding whom to vote for, evaluating news is a job that that no self-respecting person with agency would want to outsource to a third party. @ A different Martin, nice to read a calm and pertinent comment. Bias shouldn’t apply when facts are reported, bias is as natural as subjectivity when it comes to opinions. Bias is not concerned when an opinion is stated as such which is why we may remember what we were told when we were kids : “Precede your opinion with ‘My opinion is that…”. I believe as well that there is a psychological dimension in the process of learning which is the call for certitudes: “this is” or “this is not” when “I don’t know” should apply when evidence lacks. We don’t like to not know, we dislike even more to recognize that we don’t know, ignorance is the lot of ignorant, the signature of an out-of-the-game status, the credo of the weak : even if we’re uncertain we must never show it and, unconsciously, we start to consider as true our position in order to avoid psychological conflicts (lies induce far more sufferance to their authors than fabrication). My belief is that we should be teaching in school philosophy before anything else, its the basis of all our relationships to information, knowledge. Teach kids (and ourselves!) to ask themselves “Why?”, why do I believe this, why do I disagree with that, why? If I cannot answer then I should start wondering about my convictions. Teach kids to struggle for knowledge but remain opened to doubt, to uncertainty. Many conflicts and are are related to certitudes. “calm and pertinent” could be a criteria to detect news or fake fake news. But wonder who could be judge them pertinent? This is very naive. Not only there is already “bias” in the way the fact report is worded (“terrorists” or “resistance fighters” did something), but more importantly, there is “bias” in the facts one chooses to report, and this one can be terribly efficient to manipulate people, without even relying on fake facts. Like always talking of people killed because of insurgents in a country you invade, but hardly mentioning the thousand times more numerous people you killed yourself. Like talking everyday for years about a single bomb that killed 10 persons while hardly mentioning the lot more your police has been killing all these years. @Anonymous, when I write “Bias shouldn’t apply when facts are reported” I mean that if there is one category of news where objectivity is possible and required it is indeed that of facts. Now, as I understand your comment, facts themselves, even if objectively reported, may be biased by the terminology, the rhetoric, maybe even the style used to report them. I agree. In your example of “terrorists” and “resistance fighters” I’d consider that honesty would required “armed forces” as a neutral denomination. On the other hand terrorism may be understood as warriors of terror and apply as well to “state terrorism” even if that acceptation of the word is not widely recognized. It may be complicated as all expression is often complex and may seem to present a bias even when there was no bias intention. This is related to the problem of communication. Even between two persons understanding each other is not always obvious, so let’s imagine the exponent when it gets to one source communicating with hundreds, thousands, millions of individuals : a same wording may be understood differently and neutrality, even if the reference of the journalist, may appear to be biased. I think language is complex. What I mean to say is that, even when honesty guides a comment the comment itself may be perceived as biased. On the opposite even when a comment is intentionally biased it may be perceived as honestly driven. Of course my remark completes your comment with which I do not disagree : bias can happen when reporting true facts in the very way they are reported. What I mean is that a reader may as well be biased by his own culture, psychology, life in the way he perceives information. I had read on an aviation forum an article stating something like “A black forty-five year old woman has been forbidden to embark on her flight due to her over-weight”. I could have read (hypothesis) in a local gazette of some lost town in deep Central Africa “A white thirty-two year old man has ran his car over a young girl of the village”. Now : should the journalist avoid being specific on the color of skin? Is this racism? It’s true, but is bringing this supplement of information a way of biasing the essential of the information? IMO it may be as it may be not. I wouldn’t bring that extra myself but I wouldn’t systematically believe racism is the reason. A supplement of information may as well be information only considered as specific given the area is mainly white or black. In the same way stating “Frankenstein raped by a blond teenager” (besides obvious fake news!) is no necessarily a pick on blondes nor on teenagers but may as well be information considered as full given all details are provided. In the doubt i’d avoid, personally, being too specific, not because I’d consider being racist but because I’d consider what a reader may conceive my words. Complex. The idea is that we have to consider not only what we say/write but as well the way it will be perceived. “calm and pertinent” could be a criteria to detect news or fake fake news. But wonder who could judge them pertinent? I guess that if fake news make their way it is because naive readers consider them pertinent and lucid but dishonest readers consider those fakes will feed their propaganda as references to legitimate their aims (“I read it there, you see it’s serious…”). Basically fake news, that is those which report a non-existent fact, can we as smartly crafted as a high-level lie, expressed with calm and the required touch of pertinence (not excessive because it might look as a fake), far from the extravagances of sensationalism. Lying is an art, always reprehensible but less exasperating when performed by an artist of the genre, maybe because, beyond ethics, idiocy irritates more than dishonesty even if dishonesty revolts more than idiocy. But when you have both you sort of drive out of your mind! I mean, the least you can do when lying is to lie with the minimum effort of creativity and imagination that proves you nevertheless have a basic respect for the one(s) you lie to. Like Martin and others have stated here, I believe as well that the best approach to “weigh” an information is to confront it to several other sources… or to have such a talent, a knowledge of mankind, maybe because nothing better to detect a liar than to either be one, either having been one, either having all the skills to be one whilst deliberately choosing to (try) to avoid being one! About delicat subjects, is your pseudo “Tom Hawack” your real name or are you like this “Thomas Hawk”.. fake anonymous? maybe it’s you? just curiosity.. (a true specialist in fake news, a “bel emberlificoteur” this “Thomas Hawk”, so many Thomas/Tom/Hawk/Hawack on the internet.. that’s why I’m prudent). Read you later, Tom. @ Anonymous, the article you link to is seven years old! Looks like Flickr survived. In the same way that Groucho Marx would have been an odd communist! Un esprit intelligent supérieur à la moyenne ce “Thomas Hawk” qui voulait à l’occasion du changement de design de Flickr à tout prix se faire embaucher par Yahoo. Un esprit qui a passé son temps durant la période des milliers de mauvais feedbacks à intimider les utilisateurs mécontents par des moyens divers, utilisant un tas de fake profiles. Le seul à faire l’apologie du nouveau Flickr. Puis plus tard quand il a dû se rendre à l’évidence qu’il ne serait pas embauché, il a tourné sa veste. Un jour fausses allégations intéressées, le lendemain vraies, puis le surlendemain fausses. Même Eyeo (les yeux qui surveillent d’en ô) ne pourrait y retrouver ses petits. On peut être pertinent et dire des conneries, parfois aussi le calme est synonyme de malaise annonceur avant la tempête d’une big entourloupe. Je me demande si je préfèrerais pas une forme de violence contenue et d’un certain dilletantisme dans la diffusion de mon humble opinion. Tant que votre violence reste contenue ! Elon Musk has said, “the holier-than-thou hypocrisy of big media companies who lay claim to the truth, but publish only enough to sugarcoat the lie, is why the public no longer respects them”. I fear that this is yet another attempt by such companies to lay claim to the truth while simultaneously discrediting alternative, independent, or even (in many cases, if I may be blunt) conservative organizations and voices. Information warfare is real, and you know what they say, the first casualty in war is truth. All I want, and I think all people really want, is pure news, what happened, without any spin, bias, or even lies, but that has become hard to find. Monopoly, the game. Until maybe my forties I’d love this game, winning, but winning meant squeezing my opponents, ruining them. Strength, the world my oyster. Wow. Life is not a game when your success means far more than you opponent’s defeat : it’s death. Modern business, top-level (not my next-door independent grocery store) is the quest for monopoly driven by a ‘Live and let die’ cynicism considered as a normal path to success. We all know that, some of us are happy about it, many are unhappy about it and among the latter some because they are unable to be part of that world, others because they feel that whatever their skills they will never apply them to a scheme of success formally antagonist to their vision of mankind. But. If we forget societies and focus on individuals me recognize brothers and sisters and no doubt many noble aspirations and behaviors are unfolding and even marching. This is my approach to the world: never look behind the shoulders of the one you have in front of you, never conceive a world on the basis of societal and political doctrines but one lived with your relationship to individuals. Some of us are talented for ideology and ideology has changed many bad things to good ones, but also the other way around. Often also it has drown the baby with the bath water. Not my approach because I’d be unskilled for that. Back to news, information. Of course we link here to above mentioned. We have to deal with the worst without considering the binary all bad/good too easy and simplistic scheme, and participate to the best. That’s how i see it. Many individuals who have high business responsibilities within areas we denounce, those which challenge basic ethics, considered, met individually are no better nor worse than you and I : they just happen to have accepted a universe and its rules as a representation of what they conceive life to be : a jungle where the strongest survive. That doesn’t mean they have no heart, I’m sure they’d help their neighbor as others, it means they conceive another destiny of mankind than we do and are embarked in an infernal machine : swim or drown. Sorry to interrupt this long and interesting philosophical discussion but the extension says ‘insuficient data’ for all the sites I tried.